Karin is an executive development coach who works with professionals as they make that crucial step into a leadership role, going from being ‘one of many’ to ‘one of few’. She helps executives develop better self-awareness and gives them deep insights into their current situation, enabling them to set their future direction and reach their goals. 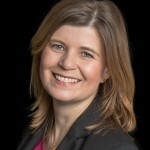 Karin has intimate knowledge of the corporate world, having spent over 16 years in senior positions in a global top 10 FTSE company, specialising in communications, reputation management and sustainability. She has first-hand experience of working effectively at all levels of an organisation and across many different cultures. Karin was born and raised in Germany. She holds a master’s degree in business from Göttingen University. She is an Associate Certified Coach (ACC) with the International Coach Federation (ICF), a member of the Chartered Institute of Public Relations (CIPR) and the Institute of Corporate Responsibility and Sustainability (ICRS). She is a Certified Integral Development Coach™ through New Ventures West. To get in touch with Karin.